This is a specific job that requires research and planning, as all appliances require specific types of coatings or paints. For example, some appliances need heat resistant coatings, while others might need waterproof paint. If you find the right method, however, the benefits of refinishing your appliances are significant. Refinishing your appliances can give them new life in terms of their appearance. This helps you to avoid the expense of purchasing a new piece, which is often considerable. If you are remodeling your home, you can use appliance refinishing to get the exact look you want. It also helps you save money while improving the appearance of your living space. You may choose to upgrade the look of your appliances for a fresh feel in an older home, or in preparation for a sale. By choosing to refinish the appliances, you can take control of your ideal home design without hurting your wallet. Spray on paint is suitable for some appliances, and is simple enough to use that you could even perform the job yourself. The type of paint required depends on the type of appliance, as well as its original coating. Enamel and polyurethane are potential choices. Liquid stainless steel may be preferred by some homeowners. It is a brush-applied paint, as it contains particles of stainless steel. Electrostatic coating requires the work of a professional, as electrostatic equipment is needed to apply the coating. The coating is electrically charged in opposition to the surface of the appliance in order to ensure a thorough bond. If you are remodeling your home with a new design, old appliances can stand out and make the design appear incomplete. However, buying new appliances can bring the budget of your project much higher than you can afford. This could mean you have to postpone your redesign, spend money you do not have to spare or keep the old appliances, leaving your new look incomplete. Refinishing your appliances is a simple and easy way to ensure that all of your appliances match the aesthetic of your redesign. Even if you are not planning a big change in your home, you may be interested in upgrading the appearance of your living space. 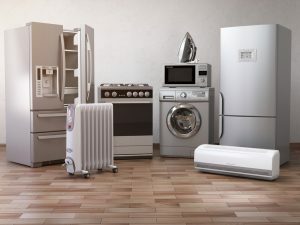 An old, scratched refrigerator in the kitchen or a damaged tub in the bathroom can make your home feel old and uncared for, even after it has been cleaned and tidied. Refinishing your appliances in a metallic or clean white coating can bring a bright, new feeling into these frequently-used rooms. You can also take advantage of appliance refinishing if you want to create the appearance of a more cohesive design in your home. If you buy a new refrigerator, you may wish you had an oven in the same style. Instead of feeling dissatisfied with your old appliance, you can change its finish for a more unified look. The two rooms in which appliances make the biggest impact are the kitchen and the bathroom. The appearance of these appliances is particularly important when selling your home, since these two rooms often have a significant influence on a buyer’s ultimate choice. Purchasing and installing brand new fittings or appliances can surpass your budget by a significant amount. Alternately, when you choose to refinish your appliances, you can save a considerable amount of money. You can then put these savings toward your moving costs or purchase new appliances for your next home. The cost of refinishing an appliance will vary depending on a number of factors. However, even the more expensive jobs are generally considered better options than purchasing new appliances. Of course, if your appliance does not work as well as it should, purchasing a new one could be a better use of your money. The type of appliance affects the kind of paint or coating that is required. For example, an oven needs a special heat-resistant paint. If you choose an unusual color or finish, this could also bring the price up. The time the job takes generally affects the price, as contractors often charge by the hour for labor. Transportation might be included in the cost if the appliance must be refinished at a work site. The expense of uninstalling and reinstalling an oven or bathtub could greatly affect the affordability of your home project. The size of the appliance affects the time it takes to complete the job, as well as the amount of paint that is required. If a larger item is taken to another site for the job to complete the job, the transportation costs might also go up. When comparing quotes from contractors, make sure to determine which of the above costs are included in the overall price. Each contractor should provide a reliable estimate for labor hours and the cost of materials. If you use paint for your refinishing, you may have the option to perform the task yourself. This can save money on the overall project, but must be done with care in order to ensure success. Otherwise, you may need to hire a contractor to fix a mistake. To avoid this, make sure to purchase the correct type of paint for your appliance and follow all instructions provided. Keep in mind that several coats of paint are often needed to perform a refinishing job. When working with paint, you should always work in a ventilated area, and wear a suitable mask and protective clothing. Depending on the state of your appliance, you may need to prepare it by buffing dents and scratches. For a metal appliance, coat unfinished areas and rust spots with a suitable primer.